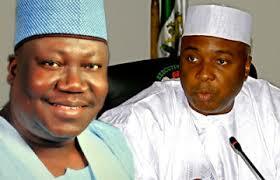 The Unity Forum Group, consisting of Senators who supported Ahmed Lawan as the candidate for Senate president, have vowed to challenge the victory of Bukola Saraki and Ike Ekweremadu as the president and deputy president of the Senate respectively. Speaking Wednesday at a news briefing attended by 23 members of the group, the spokesman, Barnabas Gemade, said that constitutional rights cannot be manipulated by an individual. He explained why members of the group were absent at the election and inauguration of the new leadership Tuesday. Mr. Gemade said an invitation was received through the office of the National Chairman of the APC, John Oyegun, that President Muhammadu Buhari wanted to have a brief meeting with the APC senators and House of Representatives members before the inauguration of the National Assembly at 10a.m. “The insinuation in some quarters that we boycotted the election is totally unfounded,” he said. “As loyal party members, we would take all necessary political and legal means to strengthen our democratic process. “In an effort to meet up with the inauguration, we rushed to honour the invitation of Mr. President at the International Conference Centre, ICC, when we got news that the Senate president elections had started. “This process which remains unconstitutional cannot confer legitimacy to the elected Senate President,” he said. He added that the decision was taken knowing fully well that the quorum for the election of the Senate President had not been met. George Akume, representing Benue State, also said that the election cannot be said to have taken place with only 51 senators.